Americas Best Value Inn Chenoa offers the most value for your money when staying for business- pleasure- or just passing through. We offer clean spacious rooms- a 24-hour front desk- free continental breakfast- business services- coffee/tea in lobby- and Wi-Fi throughout the hotel. All guest rooms include mini-fridges- hairdryers- coffeemakers- cable TV- and ESPN. Take advantage of our extremely comfortable beds and relax while saving money year-round with our Kids Stay Free Policy 11 and under in parents room. For those guests that are in town on longer term corporate assignments or business trips we also offer special weekly and monthly rates- as well as direct billing options. For your convenience our hotel offers both smoking and non-smoking rooms. We are centrally located near attractions such as the Matthew T. Scott House- Illinois State University- the Chenoa Veterans Brick Walkway- and the International Walldog Mural and Sign Art Museum. We are just off Interstate 55. 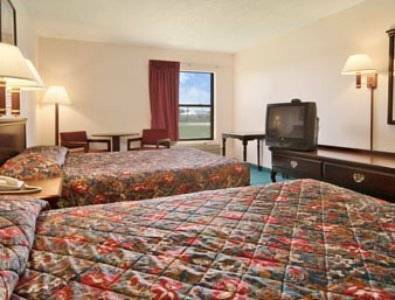 Americas Best Value Inn Chenoa is your best choice within the Crossroads of Opportunity. We offer ideal accommodations and location whether you are in town for sightseeing- vacation- business- or simply passing through on your way to Chicago or St. Louis. At Americas Best Value Inn Chenoa our goal is to provide our guests a great experience- not just a place to stay. At Americas Best Value Inn Chenoa- Weve Got You Covered from the time you hit the road until your head hits the pillow. Americas Best Value Inn Chenoa is near attractions such as the Matthew T. Scott House- Illinois State University- the Chenoa Veterans Brick Walkway- and the International Walldog Mural and Sign Art Museum. We are just off Interstate 55. Our address is 2163 Hoselton Drive- Chenoa- IL 61726. Cars, jukeboxes, a house made of steel -- if it's old and had something to do with Peoria, this museum probably has it. Look for a unique singing barbershop quartet of former Presidents. Perhaps best known from the 1980 Blue Brothers movie as the prison Jake Blues was released from. The old prison is closed, but an adjacent parking lot and park offers an up close vantage point, and signs provide information on history and Hollywood infamy. Lincoln's personal record of deposits and withdrawals is exhibited in his bank, in a fancy brass-and-glass case.